The UK has raised terror threat level from “severe” to “critical”, its highest level, meaning further attacks may be imminent, PM Theresa May has announced. Military personnel will now be deployed to protect key sites as a result of the new threat level. Meanwhile, the mother of 15-year-old Olivia Campbell said her daughter died in Monday night’s Manchester bombing, which killed 22 and injured 59. Writing on Facebook, Charlotte Campbell paid tribute to her “precious” daughter. She had issued an emotional plea for information on her daughter’s whereabouts after the Ariana Grande concert. According to Reuters, the Polish foreign minister has said that two Polish people who went missing after the attack are among those killed. The change in terror threat comes after investigators were unable to rule out whether suspect Salman Abedi acted alone, PM Theresa May said. She said soldiers would be placed in key public locations to support armed police in protecting the public. Military personnel may also be seen at other events over the coming weeks, such as concerts, the prime minister said, working under the command of police officers. Theresa May said she did not want the public to feel “unduly alarmed” but said it was a “proportionate and sensible response”. A hotline has been set up for people concerned about loved ones – 0800 096 0095. The highest threat level, which is decided by the Joint Terrorism Analysis Centre – a group of experts from the police, government departments and agencies – has only been reached twice before. In 2007, security chiefs raised it once more as they hunted for the men who had tried to bomb a London nightclub, before going on to attack Glasgow Airport. 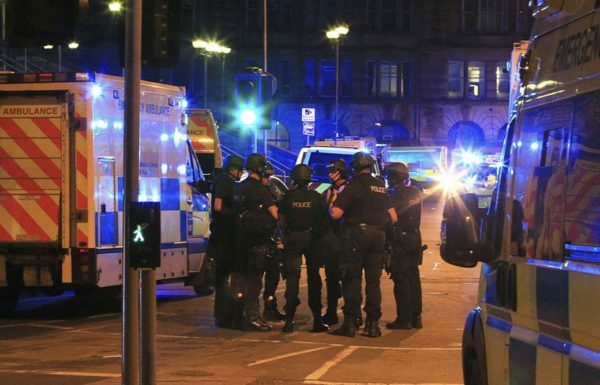 Former Salford University student Salman Abedi – understood to be a 22-year-old born in Manchester to parents of Libyan descent – is thought to have blown himself up in the arena’s foyer shortly after 22:30 local time on May 22. Fans were beginning to leave a concert by Ariana Grande. Three of his victims have been named – Saffie Rose Roussos, eight, Georgina Callander – thought to be 18 – and John Atkinson, 28. ISIS has said – via its channels on the messaging app Telegram – it was behind the Manchester attack, but this has not been verified.